The SeaTel ST60 Satellite TV features a cutting-edge pedestal based on Sea Tel’s leading 09 series antenna platform and highly-efficient back-fire feed, delivering high-quality satellite programming anywhere in the world. The SeaTel ST60 Satellite TV’s pedestal design enables users to watch TV even in some of the world’s most remote waters via global circular C-band services. The SeaTel ST60 Satellite TV system has been protected against motion and connection interference to ensure consistency of operation and unspoilt viewing pleasure for everyone on board. The SeaTel ST60 Satellite TV’s complete antenna stabilisation system including proprietary antenna control and fast-track signal lock software detects the slightest motion and compensates / corrects accordingly. The system supports any number of satellite receivers so many TVs can be installed and individually programmed for the enjoyment of everyone on board. The SeaTel ST60 Satellite TV is compatible with most C-Band HDTV and Broadcast services worldwide for digital TV and music programming, so with the ability to have as many TVs on board as you like, everyone can watch their favourite programmes. With the Sea Tel ST60 Satellite TV system you can operate with the confidence that the passengers and crew enjoyment of satellite TV and radio will remain uninterrupted regardless of the course and number of turns the vessel makes. The SeaTel ST60 Satellite TV features Unlimited Azimuth range, which secures continuous reception using a rotary joint, which means no waiting to unwrap antenna cables on vessels with complex routes such as survey ships. The means you can be sure of a reliable signal at all times. 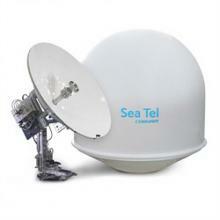 A built-in GPS antenna and proprietary algorithms give the Sea Tel ST60 Satellite TV swift satellite acquisition and navigation capabilities.